What changes make the 2018 Lexus RX different? A third seating row to create the first seven-passenger version of America’s best-selling premium SUV. Increasing capacity from five gives Toyota’s luxury division its first direct competitor to the Acura RDX, Infiniti QX60, and Volvo XC90 — the only other currently available upscale midsize three-row crossovers. The seven-seat RX will be sold alongside the five-seat model, which carries over for 2018 with few changes. Borrowing the five-seater’s styling and likely offering both the RX350’s gas engine and the RX450h’s gas-electric hybrid powertrain, expect the seven-seater to be badged, respectively, the RX350L and RX450hL. It’s uncertain, however, whether it’ll launch as a 2018 model or as a 2019. Lexus had released no information on the seven-seater as of Oct. 2017, but did confirm the model-year 2018 version of the five-seater will go on sale in January 2018. Introduction of the “L” is expected around the same time, but when it’ll go on sale is not known. A calendar-2018 debut makes it eligible to be designated a 2019 model. Choose the five-seat version and you’ll be getting spacious accommodations and plenty of cargo volume in a package that’s highly refined and extravagantly styled, if rather unexciting to drive. Lexus makes both the RX350 and RX450h slightly more attainable for ’18 by juggling standard and optional amenities and creating essentially a de-contented base version of the hybrid (see details below). 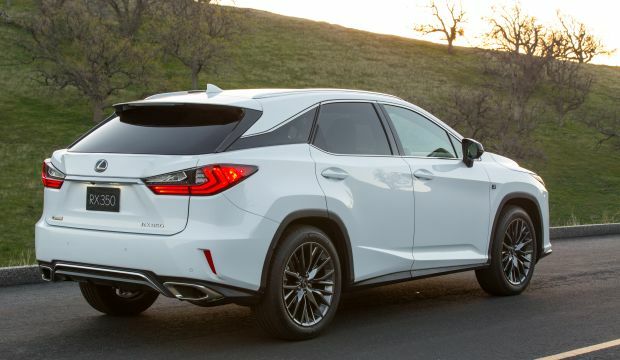 The RX is Lexus’s most popular vehicle and slots into its crossover roster above the compact-class NX. The confirmed ’18 lineup consists of the RX350 with a gas-only V-6 and the RX450h with a gas V-6 assisted by battery-powered electric propulsion. In a nod to drivers seeking greater involvement, each is again available in F Sport form, which delivers modestly upgraded handling, special exterior trim, and unique front seats and interior décor. Regardless of its model-year designation, the three-row version should boast the same outstanding quality, comfort, and customer service that have been among the keys to success for the current RX. There’s little doubt the increased capacity will be attractive to upscale family buyers sold on the Lexus experience. While the Lexus GX and LX can seat seven, they’re traditional truck-based sport-utilities with far less third-room and comfort than more carlike crossovers like the RX. The automaker may well elongate the current RX350 and RX450h hybrid to accommodate the third seating row – more on that below. But given their different demographic appeal, it’s questionable whether Lexus will offer the L models in F Sport trim. Technically, you’ll need to if you want a seven-seater and Lexus labels it a 2019 model. Moreover, the L versions may help usher in the freshened styling awaiting all versions of the RX. Today’s generation of this crossover launched for model-year 2016 and likely will be fully redesigned for model-year 2021 or ’22. That leaves the 2019 RX ripe for a midcycle update that would include appearance revisions to nose and tail, styling that would be shared by the seven-seat models. In any event, don’t look for significant changes to basic engineering or powertrains for 2019. The 2019 RX350 and RX450h won’t differ materially from the ’18s, meaning that waiting for a ’19 would get you virtually the same crossover, but with potentially updated styling and almost certainly higher prices. As for the manner in which the L models will incorporate that third seating row: the Highlander crossover from Lexus’s parent company, Toyota, shares the RX’s basic engineering and can accommodate up to eight passengers on three seating rows. Highlander’s reasonably adult-friendly third row fits into a body no longer than that of today’s five-seat RX. The corporate cousins also share the same wheelbase (the distance between the front and rear axles). So it’s conceivable the seven-seat RX won’t actually be any longer overall than the five-seater — although Lexus’s apparent intent to put “L” in it name suggests otherwise. Not for 2018, not even a new color choice – the caveat being introduction of the L version as an ’18 model, which could of course mean an elongated body. Don’t expect real appearance alterations until the midcycle freshening. The current styling came on line with the RX’s model-year 2016 redesign. Its jangle of angles, medieval-faceplate grille, and blacked-out “floating” rear-roof pillar has proved less polarizing with time. Regardless of seating capacity, all 2018 RX models again come standard with 18-inch alloy wheels; 20s are optional and, with a darker finish, again part of the F-Sport package. F Sports return with their more aggressive-looking front fascia, black-mesh grille, and black instead of body-colored mirrors. Inside, the ’18 RX remains comparatively conservative in design. It carries over clear, logically arrayed controls and swathes most every surface in soft-touch padding or quality-finish plastic. A convincing faux-leather material Lexus calls NuLuxe is again be standard on the RX350. 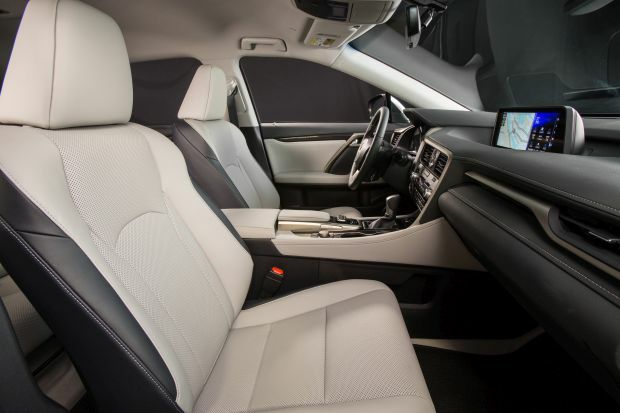 Leather will likely continue as part of the RX350 Luxury Package and on the front seats of F Sport versions. Leather had been standard on the RX450h, but to lower the price of admission to the hybrid line, it’s among items Lexus makes optional for 2018. See the “new features” section below for more details. Real wood cabin trim continues as standard on the RX450h. And wood appliques and ambient lighting return as part of the RX350 Luxury Package, which also includes aluminum trim similar to the metal in the F Sport. None. 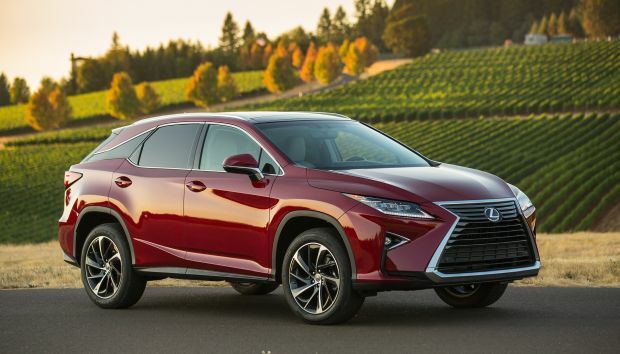 The RX350 – even in prospective seven-passenger guise — continues with one of the competitive set’s least powerful standard engines: a 3.5-liter V-6 of 295 horsepower and 267 pound-feet of torque. Nevertheless, it works splendidly with the 8-speed automatic transmission to furnish smooth, prompt throttle response and acceleration that’s more than adequate, if not heart-pounding, at around 7 seconds 0-60 mph. The 2018 RX450h (and potential RX450hL) returns with a 3.5-liter V-6 teamed with an electric motor for a net 308 horsepower (Lexus doesn’t specify torque output). The system uses a continuously variable automatic transmission. This hybrid isn’t designed to run on electricity alone and isn’t a plug-in, relying instead on regenerative braking to recharge the nickel-metal-hydride battery pack. It’s 350 pounds heavier than the gas-only RX, and isn’t as fast overall, at closer to 8 seconds 0-60. But the RX450h is satisfyingly quick off the line and strong during merging and passing. All gas-only models come with a choice of front-wheel drive or an all-wheel-drive (AWD) system intended as a traction enhancer on snowy roads or gravely surfaces. The hybrid RXs continue standard with an AWD setup that uses a second electric motor to drive the rear wheels. As does the AWD system in the RX350, it operates primarily in front-wheel drive and shuffles power rearward when sensors detect front-tire slip. Given any as-yet undetermined extra weight, the “L” models would likely sacrifice some acceleration versus their five-seat counterparts. They’d probably be less agile, too, though truth be told, no RX – not even an F Sport – entices you to race down a twisty road. Leave that to rivals like the Jaguar F Pace and Porsche Cayenne. Still, Lexus’s midsize crossover handles with impressive equanimity, excelling at relaxed cruising and composed in city/suburban duty. Ride quality is best with the standard 18-inch tires. The lower-profile 20-inchers don’t filter out sharp bumps nearly as well and they generate more tire noise, too, compromising by degree what’s otherwise a model of automotive serenity. EPA ratings for the 2018 RX were not released in time for this review but don’t expect them to change for the five-seaters. That means RX350 and RX450h fuel economy should remain among the best in a class where, admittedly, high mileage generally takes a backseat to luxury, performance, and prestige. Expect 2018 RX350s to again rate 20/27/23 mpg city/highway/combined with front-wheel drive and 19/26/22 with AWD. The RX450h, available only with AWD, should again rate 31/28/30 mpg. A 1-2-mpg penalty for the heavier L models would not be unexpected. Lexus recommends 87-octane gas for the RX350 but says the RX450h achieves top performance and mileage with premium-grade 91-octaine gas. Nothing new, per se, but some re-arranging may well help Lexus keep model-year inflation in check – maybe even lower the cost of entry – once 2018 RX prices are released. In the 2018 RX350 line, the blind-spot monitor and the standard-size power moonroof are now available without also having to order heated and ventilated front seats, power folding rear seats, or the Premium Package. That package includes a rear armrest storage compartment, aluminum roof rails, driver-seat easy exit, and memory for the power driver’s seat, steering column, and mirrors. To in effect create a “stripper” base-model hybrid, Lexus fields a 2018 RX450h without the previously standard moonroof, navigation system, blind-spot monitor with rear cross-traffic detection, heated and ventilated front seats, and, as mentioned earlier, leather upholstery. Navigation, the heated and ventilated seats, and the blind-spot monitor are now stand-alone options. An RX450h Premium Package is introduced and includes leather upholstery, plus the rear-armrest storage and power-memory accessories. Finally, Lexus extends complimentary coverage under its Enform assistance service to the first 10 years of RX ownership, rather than the just the first year. The Enform Safety Connect provision uses the RX’s built-in GPS technology to provide a variety of services, including stolen-vehicle locator, emergency road assistance, and automatic collision notification. Enform Service Connect provides email or mobile-phone updates for such things as fuel level, battery status, and required maintenance. The various Enform provisions had cost between $80 and $240 annually, depending on the level of service, after the 1-year trial. We’re awaiting introduction of the L models to learn details of their feature sets. Does, for example, the third-row seat come standard with power-folding capability? Otherwise, the RX line continues to offer most anything a premium-midsize-crossover buyer could want, short of high-performance horsepower or automatic parallel parking. Safety is well-covered, with every 2018 RX equipped with the Lexus Safety System+. This bundle of driver aids includes radar cruise control to maintain a set distance from traffic ahead, lane-departure waring with automatic steering correction, and high-beam headlamps that automatically dim for oncoming traffic. Its key feature is pre-crash warning and autonomous emergency braking to mitigate a frontal collision with another vehicle or a pedestrian. That ability to automatically come to a full emergency stop helped earn the 2017 RX the industry’s most coveted safety rating, the Top Safety Pick+ award from the Insurance Institute for Highway Safety (IIHS). The award also tests headlight performance, which the Lexus aced thanks to the steering-linked bi-LED lamps standard on the ’17 RX350 and optional on the ’17 RX450h. Among other returning standard features on every RX are heated mirrors, a power liftgate, keyless entry with pushbutton start, power front seats with power lumbar, power tilt-and-telescope steering column, dual-zone automatic climate control, a 40/20/40 split-folding rear seat, and a rearview monitor. An infotainment system with Siri Eyes Free connectivity and an 8-inch dashboard screen is also be included. So is the Scout GPS Link to provide cellphone-based turn-by-turn navigation with voice guidance on the RX’s dashboard screen via Bluetooth. The app is available at the Apple App store and through Google Play for Android devices. An outstanding imbedded navigation system is again optional and available with a 12.3-inch screen with 3D representations of key buildings and landmarks. They weren’t released in time for this review, but – baring the cost-controlling effects of the new de-contented models — expect some increase for the five-seaters and correspondingly higher base prices to cover the third-seat accommodations in the L models. Transaction prices should again average around $50,000, so while the ’18 RX will remain premium-priced, it’ll remain at the low end of a category in which the most affordable versions of crossovers such as the Mercedes-Benz GLE and BMW X5 start above $50,000. Estimated base prices here include the manufacturer’s destination fee; it was $975 for the 2017 RX. Expect the 2018 RX350 to start around $44,300 with front-wheel drive and at $45,800 with AWD. Look for F Sport versions to be priced from around $50,300 and $51,700 with AWD. Estimated base price for the ’18 RX450h is $54,400, or about $57,650 in F Sport guise. The L versions should add around $1,500-$2,000 to those base prices, but the charge for popular options should be about the same. Among those would be the Luxury Package (around $4,500), with aluminum and wood cabin trim and ambient lighting, enhanced power lumbar adjustments, and 20-inch alloy wheels. Expect the return of a panoramic moonroof ($1,100); a wide-angle rearview monitor ($1,865 including a blind-spot monitor with rear-cross-traffic alert); a head-up instrument display ($600); a rear-seat DVD entertainment system ($2,095, including 11.6-inch dual screens, wireless headphones and remote control, and HDMI connection); and power-folding heated second-row seats ($1,480, including heated front seats). Release date for the 2018 Lexus RX is in January 2018. What are the top competitors? Acura MDX, BMW X5, Buick Enclave, Infiniti QX60, Lincoln MKX, Mercedes-Benz GLE, Volvo XC90. You could argue for tamer styling, but strong sales suggest buyers have responded to Lexus’s efforts to visually enliven its staid image. Same for tauter road manners; owner seem just fine with the RX’s comfort-oriented road manners. Lexus dealers have been clamoring for a seven-seat version, and with the automaker poised to deliver one, it seems the ’18 RX has its bases covered.